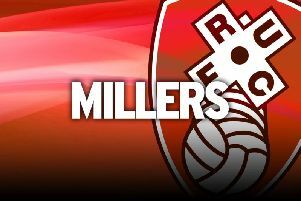 Rotherham United’s hero goalie could be an emergency forward! When Rotherham boss Paul Warne gets his full squad back together for training he might find himself with an extra option in attack than before the international break. The Millers will train as a full group ahead of Saturday's visit of Derby as Marek Rodak, Semi Ajayi and Ryan Manning all return from international duty. Warne has had no problems in sending Ajayi into attack when the Millers have been chasing games in the past, but after Rodak's antics while away with Slovakia Under-21s, the boss might consider using the goalkeeper as an emergency forward. Rodak, on a season-long loan from Fulham, grabbed the headlines by scoring an injury-time winner for his country in a European Championship qualifier in Iceland. The keeper, who had just conceded a goal, went forward for a corner and headed home from six yards to spark wild scenes of celebration after a 3-2 win. His threat in the opposition box adds another string to his bow as Rodak has enjoyed an impressive start to the campaign for the Millers. He has kept two clean sheets from six games and no goalkeeper in the division has made more saves than Rodak. Warne will hope Ajayi can go to the next level after making his full debut for Nigeria. The defender played 90 minutes in the 2-1 win over Liberia, but gave the penalty away that led to Liberia's goal. Manning played 54 minutes for the Republic of Ireland Under-21s as they were hammered 6-0 by Germany. Meanwhile, Richie Towell is disappointed he will not be sharing a dressing room with David Ball any more. The pair formed a strong friendship last season, holidaying together over the summer, but Ball joined Bradford on the day Towell returned to the Millers. Towell exclusively told The Star: “I was really sad. Me and Bally spoke a load over the summer and were in Dubai together, we had a great holiday and I thought I was going to come back to play with him. “Football is a strange game and it is very unpredictable and he went the day I came. “He's not too far away, so we have planned to go golfing.